Samford University is known to have many gems within the university’s history and values. Among those gems is a copy of Martin Luther King Jr.’s “Letter from Birmingham Jail” held by Special Collection in Harwell G. Davis Library. Willie Pearl Mackey (King) took the scraps of paper that King wrote on in jail and typed them in letter form. 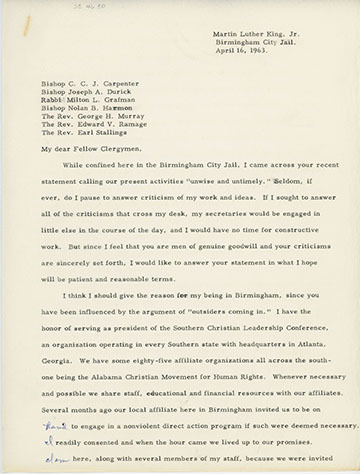 This first copy is believed to have been sent to the executive director of the Alabama Baptist State Convention before the letter was officially published. Recently, a television company in the United Kingdom requested to use Samford’s copy of the letter in a upcoming film on King. It will take the copy to interview Mrs. King about her role in the Civil Rights Movement, according to Jennifer Taylor, Samford’s Special Collection director. “It’s really exciting that someone who had a huge part in history is being given something from Samford University for her to talk about her role in the movement,” Taylor said. Samford will be listed in the credits of the film for providing assistance, and the film will be broadcast to mark the 50th year since King’s death. Every Cultural Perspectives student at Samford will also read the letter during the next academic year. The letter is just one of many treasures found in Samford’s Special Collection, Taylor said. In addition to Samford archives, the collection also houses archival materials from the Alabama Baptist State Convention, Alabama Baptist churches and other materials donated to the collection through the decades. The Special Collection staff provides research assistance and hosts tours of the collection for individuals and groups. The collection is open to the public Monday–Friday, 9 a.m.–5 p.m. Hours may vary when the university is not in session.